Following the sale of the CORREA L30/84 CNC travelling column milling machine, work started on a complete retrofit, performed by Nicolás Correa Service at the company´s facilities in Burgos and finalising with the installation and commissioning of this milling machine at the customer´s plant. This milling machine is part of the L-30 range with a fixed bed and travelling column, specifically designed to machine large-volume, complex parts. This concept of a fixed bed, travelling column means that the moving mass remains constant regardless of the size of the part to be machined, thereby obtaining a high precision finish. This CORREA L30/84 milling machine is therefore a robust, high-quality tool, able to complete a wide range of tasks such as moulds, dies, tools, etc., guaranteeing maximum reliability and performance. Some of the standard features of this milling machine include: AC servo motors on all axes and digital ammeters for the motors; infinitely variable spindle speed range; guideways with steel inserts and bronze counter guides on the Y axis, and resin counter-guides on the X and Z axes; hydro-mechanical tool clamp; and ground ball bearing spindles in all movements. NC Service sold this milling machine, in its initial condition, prior to the overhaul work, thereby showing the trust and confidence placed by the customer in our company´s professionalism and good working practices. The retrofit work was subsequently carried out on this CORREA L30/84 milling machine, covering the mechanics, electronics and control. Amongst the retrofitting tasks, particular mention should be made of the replacement of the Heidenhain numerical control with a completely new, latest generation iTNC-530, in addition to a new electrical control panel and new electronic components. Furthermore, the manual head was replaced by a new UDG type Universal Auto-indexing head with indexed positions of 2.5º and internal coolant through the spindle. Moreover, at the customer´s request, a completely new 30-tool automatic tool changer was installed in addition to a rotary table as the fourth axis. Finally, the necessary protocols were completed in order to guarantee the perfect operation, machining precision and geometry of this milling machine. In this way, the retrofit process has led to considerable improvements on the original version of the CORREA L30/84 milling machine, resulting in a technologically up-to-date milling machine, in excellent condition and offering even better performance than the original machine. The customer purchasing this milling machine is a mechanical workshop in the North of Spain, a key supplier to businesses in the rail sector. 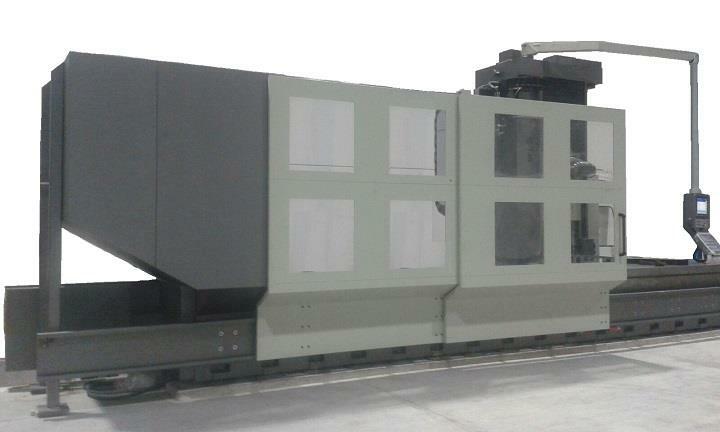 This customer primarily intends to use the retrofitted CORREA L30/84 milling machine for machining work for crane components and train running axles, achieving an excellent finish in the machining of complex parts, in addition to increased possibilities of winning new work projects.